For more information, please contact listing agents Heath Gran 605-209-2052 or Scot Munro 605-641-6482 with Great Peaks Realty. 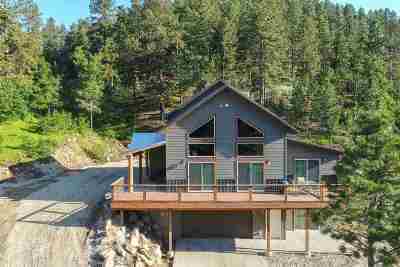 This impressive 4 bedroom cabin would be the perfect choice for your dream vacation home or recreational rental cabin investment! Constructed of Montana Lodge Pole Pine. Offers a large trex deck and multiple patios, open vaulted interior layout, large windows overlooking the views outside, 2 car garage and prime location near all of the greatest Black Hills recreation amenities! A master ensuite featured on the main level with an additional master ensuite set up in the basement with a walkout to the lower patio area. Gorgeous rustic finishes throughout. Follow the cedar stairs to the upper level loft features two additional bedrooms and a full bath. Enjoy the relaxation of a hot tub under the covered patio! Equipped with a 40 kilowatt NG generator. Siding comes with a 30-year paint fade warranty.